We all need electricity daily. We just can’t live without it. We’re surrounded by electrical appliances; fridges, TVs, washing machines, etc. We need a proper electrical system in place continue living comfortable life. Any problem, whether small or large, may result in a disturbance in our schedule and life. Our electricians can handle every issue related to electrical systems and fittings in every building. From homes to offices to complexes, our electricians can work everywhere. We can provide all kinds of electrical services in any part of Bahrain. Whether it be installing a new cable or changing a bus bar, whether a broken switch or a tripping item, our professionals are always there to fix your problem. We have a team of well-trained and licensed electricians who can take care any electrical problem in your home or office. Our electricians can handle each and every problem. If you’re looking for electrical services in your house or a workplace or a complex or any other building, we offer best electrical services in a sophisticated and professional manner. Our electricians are available for service on all days for appointments. Our services are always kept improving with sharing of experiences and through constant training with latest trends being imparted to them. You’ll never find an electrician with outdated knowledge from Handyman. You’ll never be disappointed with us. Power Distribution – Generator system installation, maintenance, etc. Our work begins when you raise appointment query with us. Once we get a booking, one of our electricians’ teams will visit your place for an inspection. They’ll take a look at the place to identify the problem. In case the problem is small and quickly addressable, you may get the problem fixed right away. For bigger problems, such as electrical system failure or constant tripping problems, which usually take a lot more time than just a few hours, our professionals will take a thorough look and produce an estimate amount of time and cost that would be incurred at the place to complete the work. Our electricians will guide you through the entire work process that will be required to be done in order to restore the electrical supply back to normal. The estimated cost of the work is given to you before taking the job. We charge a modest fee for visiting, which is waived off later on in case you decide to let us do the work after taking the estimate. The final invoice is presented only after you allow us to do the job and the entire work is completed. Why are our Electricians are the best in Bahrain? At Handyman, it is our belief that progress can be achieved only through constant development. We constantly keep updating our knowledge with the latest trends and technologies that are present in the world. Right from incandescent bulbs to LED lamps, our electricians are always aware of their working. We keep sharing our experiences with others. We continually train our electricians to keep them at their best. We strive for better. We keep moving forward through constant development. Our electricians’ team will reach your place quickly if you want them right away – or at the time of your choice if you want them to come later. Since most of the repairs and installations are possible in a short amount of time, we’ll solve most of the problems right away. Only major repair works will take some time. But even that will not be too much to cause you trouble. Because of this nature of our work culture, our workers stay on the top of their game. That is how we can rise above the competition and provide the best electrical services in Bahrain. Many small issues can be handled pretty quickly by us, like changing a fused light bulb on our own. However, we may not know of the complete issue and may end up suffering an electrical shock, or even worse setting the place on fire. We recommend not attempting anything unless you are sure of the situation. For all the problems that you cannot handle something or aren’t sure about it, just give us a call. That is where we come into the picture. We handle every electrical problem whether at your home or the office, with equal finesse. Handyman electrical services include designing of electrical systems for homes and offices, repair of any broken circuitry, sockets, switches etc., installing new outlets, fixing all major and minor problems related to the electrical systems and appliances in the building. Handyman is available on the phone on all days. We take bookings and appointments every day. You may book an appointment with our electricians between 8AM-8PM on any day. You may call us to pay you a visit in advance or on an emergency. We try our best to provide reliable services to our customers. Our workmen are thoroughly professional in their work and always provide honest opinions and estimates. We are a service company renowned for trustworthy, reliable and professional services throughout the country. An electrician’s job is to install, repair, maintain, design and troubleshoot an electrical system. Their primary role revolves around establishing and maintaining the wiring system in a building, whether a home, office or even a mall. Handyman electricians are capable of installation, repair, inspection, troubleshooting, the design of all electrical systems in all types of buildings. Handyman electricians provide all of these services all over the country. What is Covered in Their Skillset? 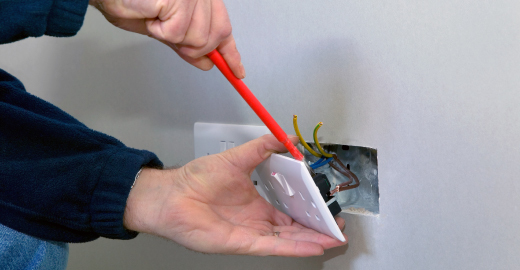 Our electricians are highly skilled and can very well fix any damaged, burned short-circuited outlets. Our electricians are also capable of handling high-voltage high-power outlets. Our electricians can design the entire electrical system of your house. Also, our electricians can add outlets into your home, with multiple plugs, and switches, if required. In case, you need USB Ports for charging your mobile phones; our electricians can add that to your electrical system as well. Our electricians are very well aware of the 220V/50Hz AC systems that we use in our country. Our electricians are well-trained in installation and maintenance of all types of electrical lighting systems. They can handle regular incandescent light bulbs, or CFLs, LED lights, flood lights, Halogen lamps or even HID Lamps with equal efficiency. Our electricians can install them on walls or ceilings alike. What are the tools and types of Equipment? Handyman always keeps its workers constantly upgraded with the latest tools, gadgets, and equipment so that they can do their job perfectly. Right from pliers to special scissors and a digital multimeter to other measuring instruments, our experts have it all. Also, we keep the safety of our workmen at top priority; which is why we keep them equipped them with all the safety gear to protect them from shocks, short-circuit burns and other possible mishaps.